Teleradiology is the transmission of radiological patient images, such as x-rays, CTs, and MRIs, from one location to another for the purpose of sharing studies with other radiologists and physicians. 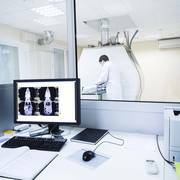 In recent years, teleradiology has rapidly moved from adjunct to essential practice in thousands of radiology departments and centres worldwide. In hospitals facing a shortage of qualified radiologists, teleradiology may be considered as a potential alternative for hiring an onsite radiologist. Moreover, because radiology capacity needs tend to fluctuate in time, temporary help may be welcome even in the absence of structural staffing problems. The main advantage is flexibility: the client hospital decides on the number and type of patient studies that will be read by the teleradiologist(s), depending on the need of the moment. Another advantage is the “on-demand” availability of subspecialists and special services. Radiomatix works with a large group of senior Belgian accredited radiologists, whereby each radiologist works as a subspecialty expert in a major – often an academic – hospital, and devotes some of his/her time (on average 20%) to teleradiology. Virtual fellowships consist of a combination of formal teaching with continued learning through overreading of interesting cases by experts (via teleradiology).